Direct trade between Aboriginal people and Europeans began in present day Alberta in the 1770s, on the shores of Lake Athabasca. 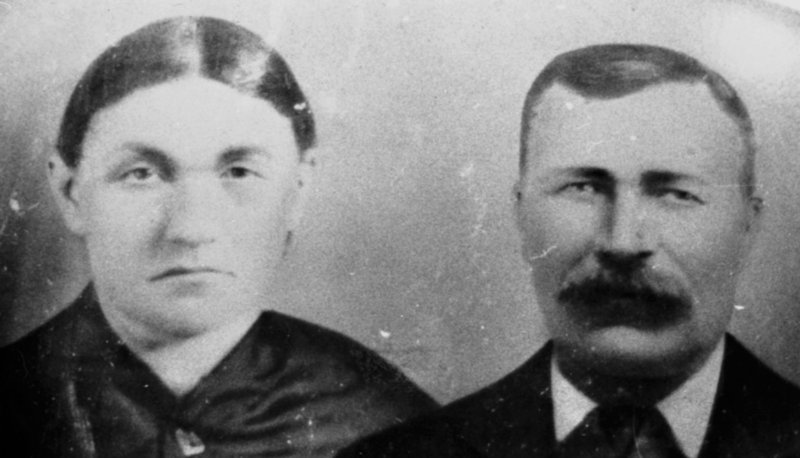 The Métis were originally a product of the fur trade—they are descendants of early unions between European explorers and fur traders and First Nations women. Within a few generations the descendants of these unions developed a culture distinct from their European and First Nations forebears. The Métis Nation was born. The Métis Nation Homeland includes all of what is now Alberta. 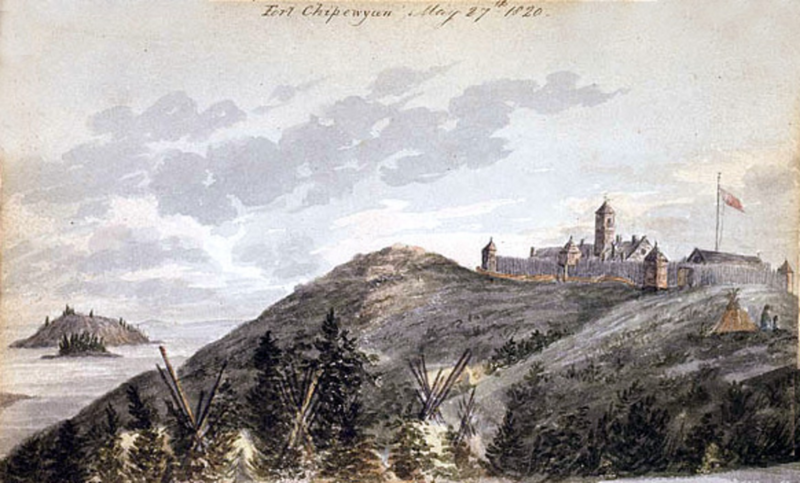 Fort Chipewyan drawn by Sir George Back in 1820, with Dene/Chipewyan tipis in the foreground. In a gift giving ceremony in 1814, Alexander Macdonnell of the North West Company presents the Métis Nation with a flag. The infinity symbol in the flag’s center represents the joining of two cultures—Indigenous and European—and the immortality of the new nation. 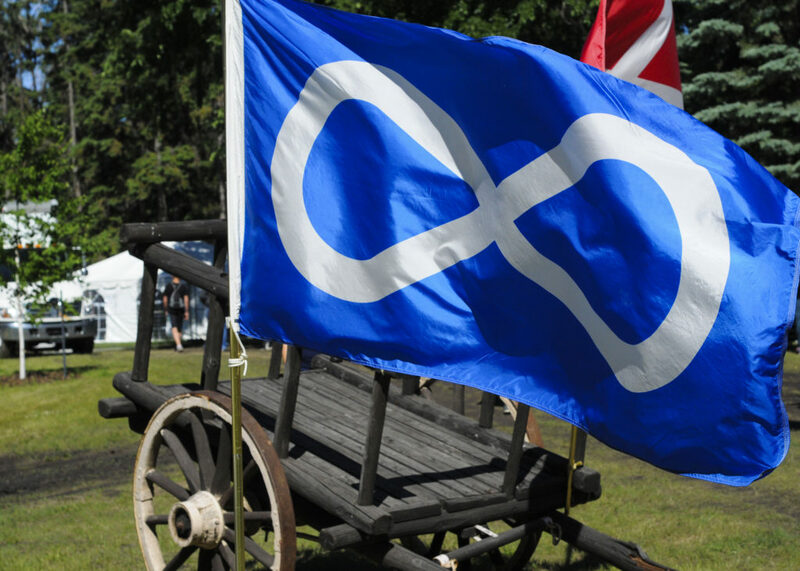 Over two hundred years later, the Métis Nation continues to fly the flag with pride. The colonial authorities in the Red River attempt to restrict the trade in pemmican. In response, a group of Métis led by Cuthbert Grant capture Fort Brandon, a Hudson's Bay Company Post. It is a victory to the Métis that cements their status as an independent nation. 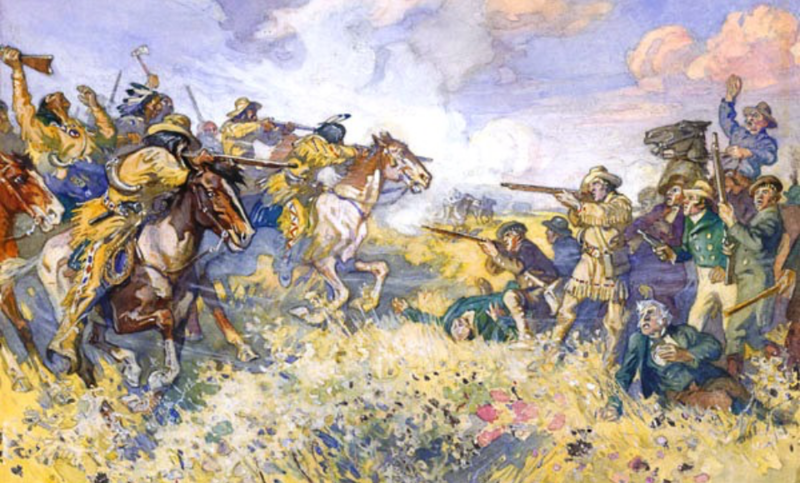 Known to Canadians as the Battle of Seven Oaks, it is remembered by the Métis as the Battle of Frog Plain. Pierre-Guillaume Sayer, a Métis man, is charged with illegally trading furs in Rupert’s Land. As his trial is held, a large group of Métis surround the courthouse. Though Sayer is convicted, he is not punished. The assembled crowd celebrates, chanting as a rallying cry, “le commerce est libre!” The Hudson's Bay Company effectively loses the ability to use the courts to enforce its supposed trade monopoly. The Hudson’s Bay Company transfers Rupert’s Land and the North-Western Territory—which include present day Alberta—to the newly created Dominion of Canada. Concerned that Canada will not respect their rights and freedoms, the Métis resist. 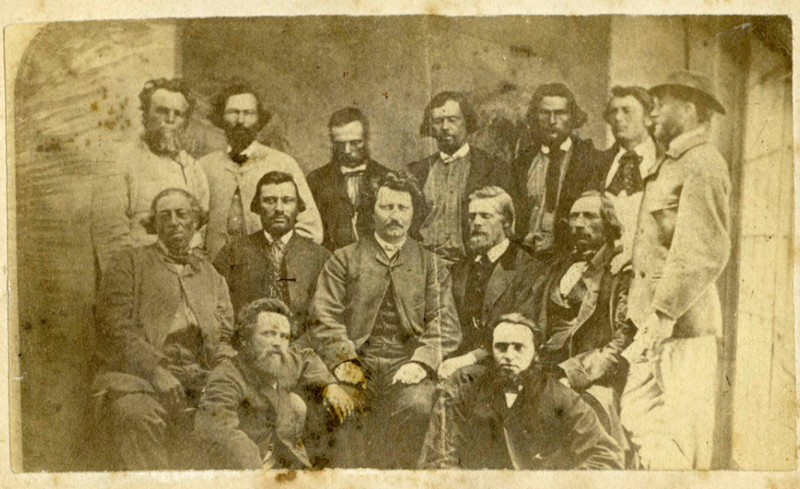 Under the leadership of Louis Riel, the Métis establish their own provisional government in the Red River. The Métis negotiate a treaty with Canada, parts of which become enshrined in the Manitoba Act, 1870. The province of Manitoba is created. 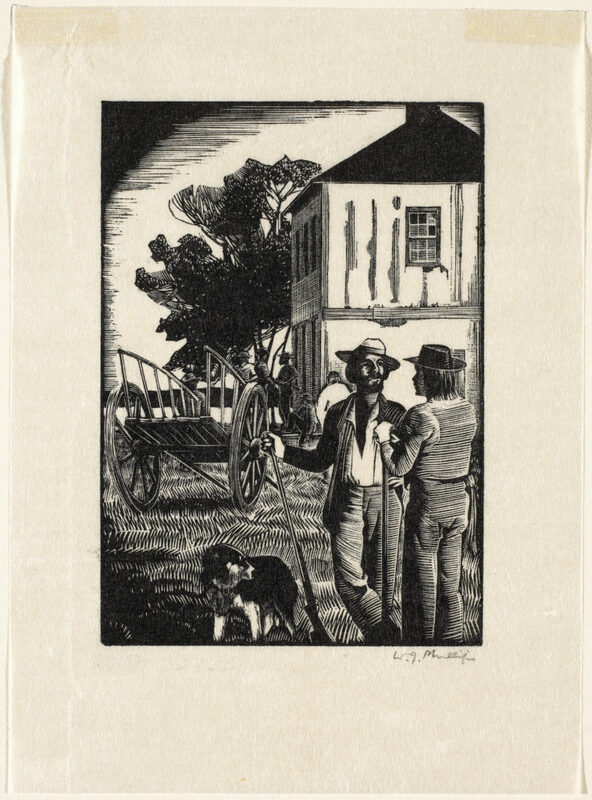 The Métis are promised, among other things, 1.4 million acres of land for their children. The Crown fails to fulfill this promise honourably. Following the incorporation of the Northwest Territories into Canada, dozens of petitions are sent to the federal government asking that Métis land rights in the territory be formally recognized. Canada’s responses are non-committal. Métis want title to their lands to be formally recognized so that they are not disposed by newly arriving Euro-Canadian settlers, as happened in Manitoba following the Red River Resistance. In the face of Canada’s failure to fulfill its promises to the Métis or to respect our rights, the Métis establish the Provisional Government of Saskatchewan under the leadership of Louis Riel and Gabriel Dumont. 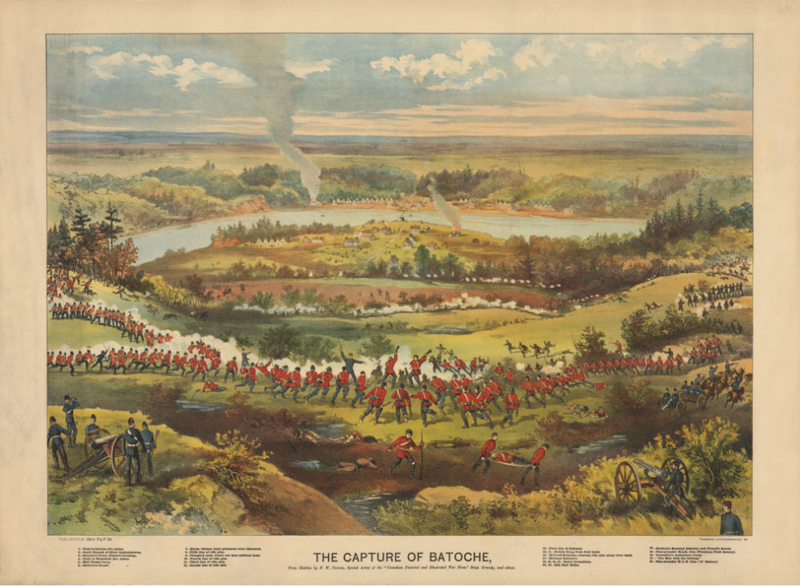 Canada crushes the Métis government in what is remembered as the Battle of Batoche. 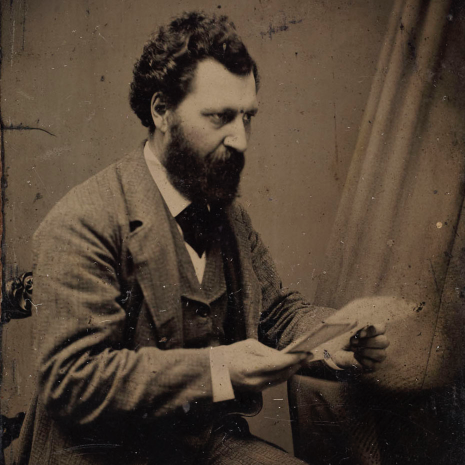 Louis Riel is captured and later executed. 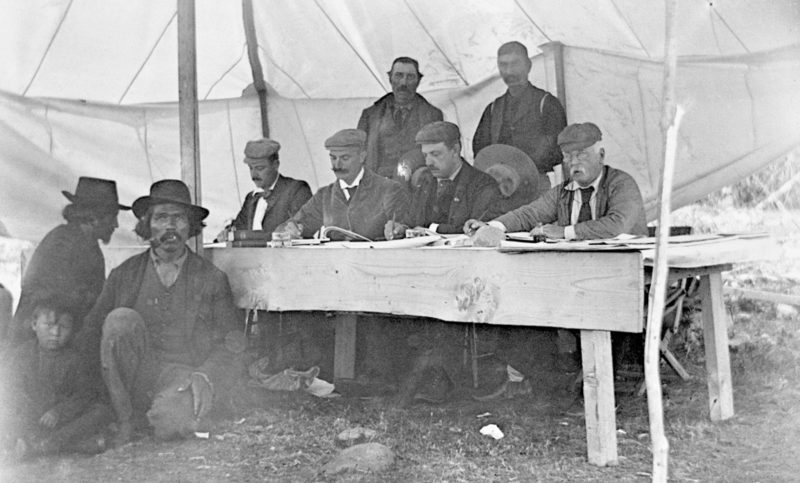 Scrip Commission meeting at Hudson's Bay Company post, Lesser Slave Lake, Alberta, 1899. Glenbow Archives NA-949-18. 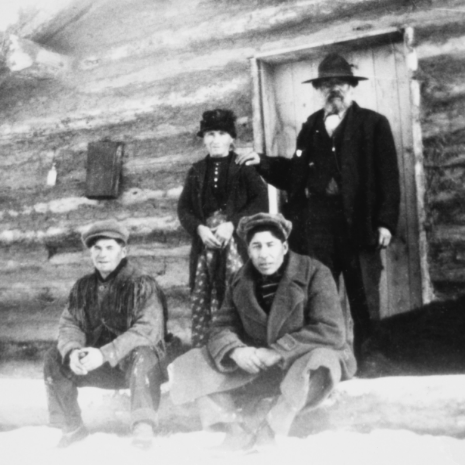 In 1896, Father Lacombe, with the backing of the federal government, establishes a reserve and school for Métis who were left destitute after taking scrip. 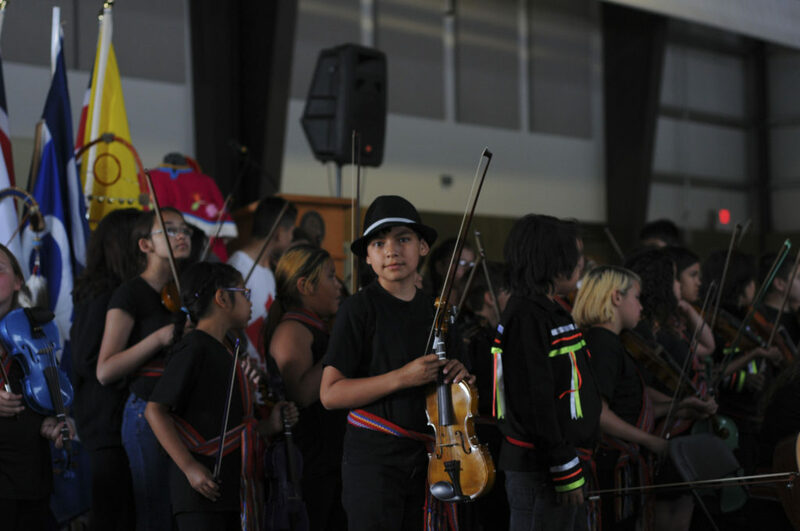 Within little more than a decade, however, the school is closed, the lands are taken over by French Canadian settlers, and the Métis are forced to relocate. 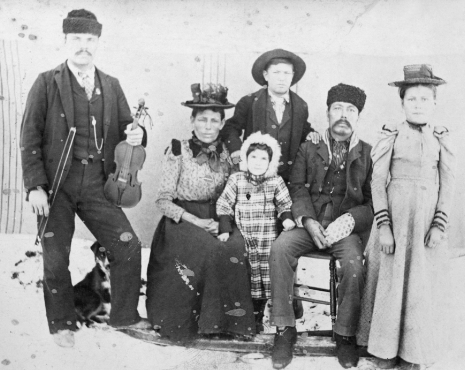 Jimmy McLean family, St. Paul, Alberta c. 1890-1910. 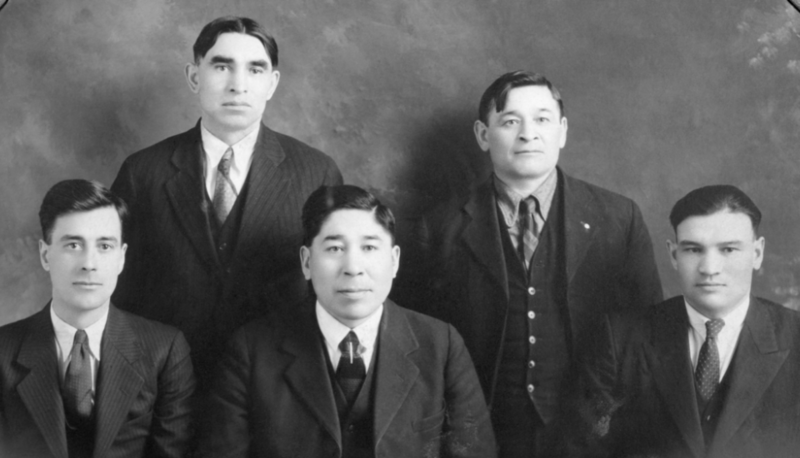 L-R: Jimmy McLean, Melanie Cardinal McLean, Flora McLean, Johnny McLean, Narcisse Cardinal, Bella Daniels. Glenbow Archives NA-4584-5. 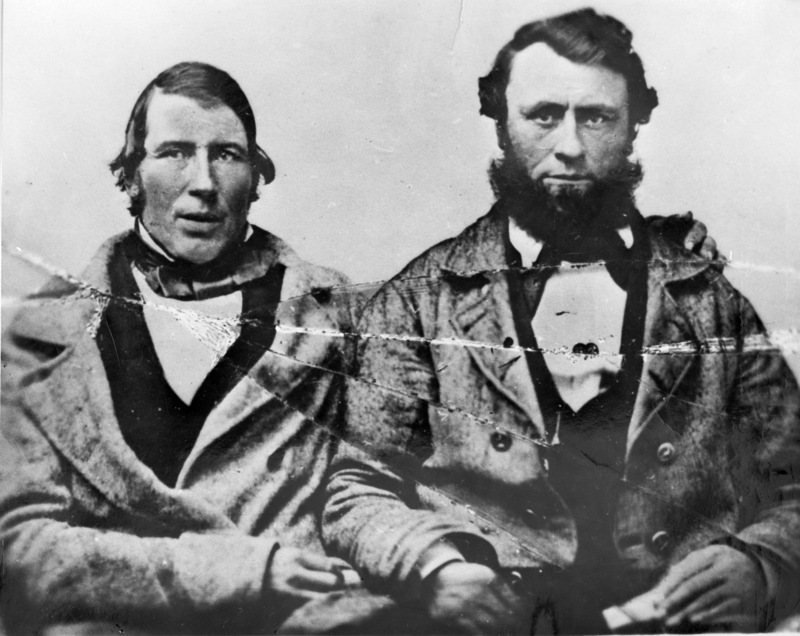 Métis in present-day Alberta establish the St. Albert Métis Association. It is formally organized, has an elected president, and conducts meetings using parliamentary procedure. The Association advocates for the fair handling of Métis land claims and petitions Ottawa for improvements to the scrip system. Octave and Lucy Bellerose. 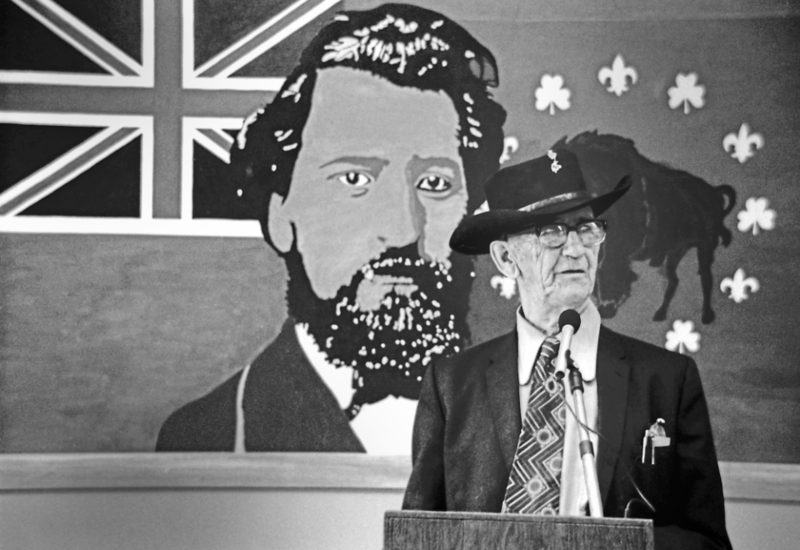 Octave Bellerose was president of St. Albert Métis Association. Musée Héritage Museum 2003.01.1704. Alberta Métis seek justice in the courts, pursuing a case for fraud in relation to Métis scrip against a prominent Alberta land speculator, Richard Secord. 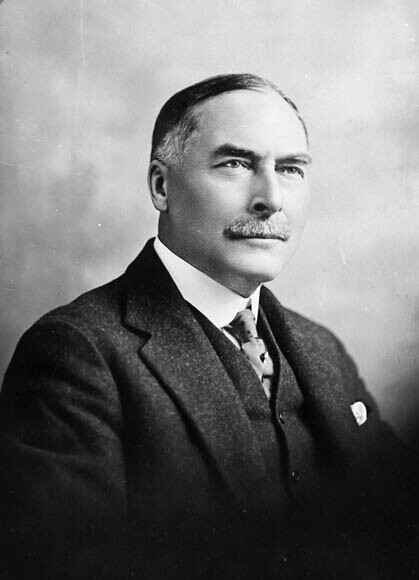 Senator James Lougheed, grandfather of Premier Peter Lougheed, argues that “there were a good many irregularities amounting to fraud and perjury in connection with the location” of lands that were supposed to have been issued to the Métis under the scrip system, but that the Criminal Code should be amended so that scrip fraud cannot be prosecuted. The amendment passes. The Métis are left without legal recourse to challenge scrip fraud. Led by Charles Delorme, Métis in the Cold Lake area organize in response to the federal government’s decision to transfer control of natural resources to the province. They are concerned about the impact of the transfer on Métis living on Crown land. They form the Association des Métis Alberta et les Territoires du Nord-Ouest. In 1932, the Association des Métis Alberta et les Territoires du Nord-Ouest is organized more formally and becomes the Métis Association of Alberta (MAA). It had 31 locals across Alberta. Joe Dion was its first president, with Malcolm Norris, Felix Callihoo, and Pete Tomkins serving as vice-presidents and James Brady as Secretary Treasurer. They advocated to alleviate Métis poverty and for the creation of a secure Métis land base in Alberta. In response to MAA lobbying, Alberta appoints the Half-breed Commission to examine and report on Métis health, education, homelessness, and land issues. Judge Albert F. Ewing is appointed chairman, and the commission becomes known as the Ewing Commission. 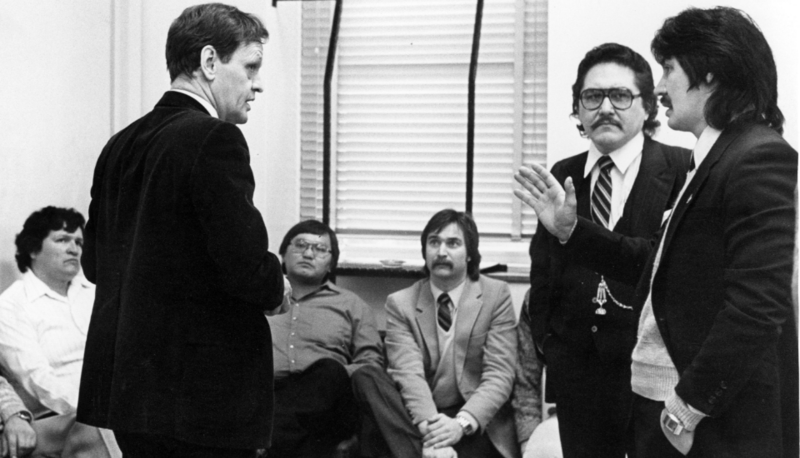 Joe Dion, Malcom Norris, and Adrian Hope consistently attended the Commission’s hearings on behalf of the MAA. After a two-year investigation, the Commission recommends that the province provide Métis with a secure land base and adequate services. 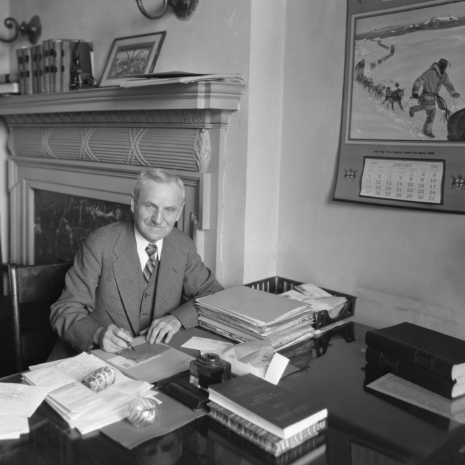 Judge Albert F. Ewing, chairman of the Half-breed Commission. Glenbow Archives ND-3-5662a. Responding to pressure from the MAA and the Ewing Commission’s recommendations, Alberta adopts the Métis Population Betterment Act, which creates the province’s 12 original Métis colonies (known known as Métis Settlements). Joe Dion at organizing meeting, Elizabeth Métis Settlement, Alberta [ca. 1939]. Front: George Ward, Joe Dion (right); standing: Madeline and Chetaee Collins. Prior to establishment of settlement. Glenbow Archives NA-5127-2. Métis serve in the Second World War, fighting for Canada. While overseas, they experience being treated as equals and are exposed to emerging international concepts of human rights and self-determination. 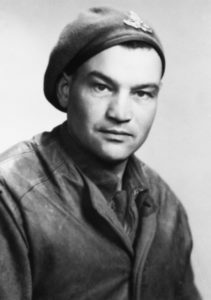 James Brady, founding member of the Métis Association of Alberta, while serving with the Canadian Armed Forces in Holland (1944). Glenbow Archives NA-3517-3. In keeping with an international trend towards decolonization and self-determination following the Second World War, Indigenous people across North America mobilize in defence of their rights. In Canada, the Métis Nation is at the forefront of the movement. 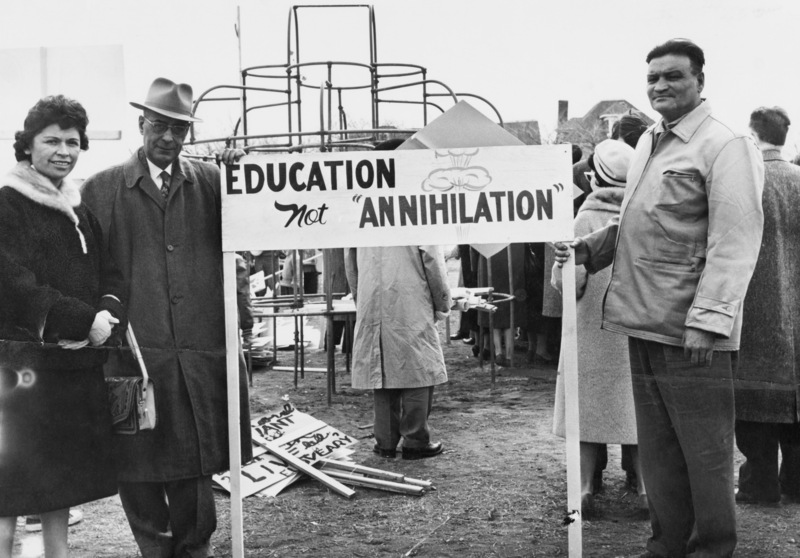 Malcom Norris and James Brady, founding members of the Métis Association of Alberta, with Jean Cuthand at a demonstration in Regina Saskatchewan (April 1, 1961). Glenbow Archives PA-2218-943. Adrian Hope, MAA President (1961-67) [ca. 1978] © Denis Wall Images, 2017. The MAA Bylaws are amended, for the first time creating 6 “Zones” (the precursors to the MNA’s present-day Regions). 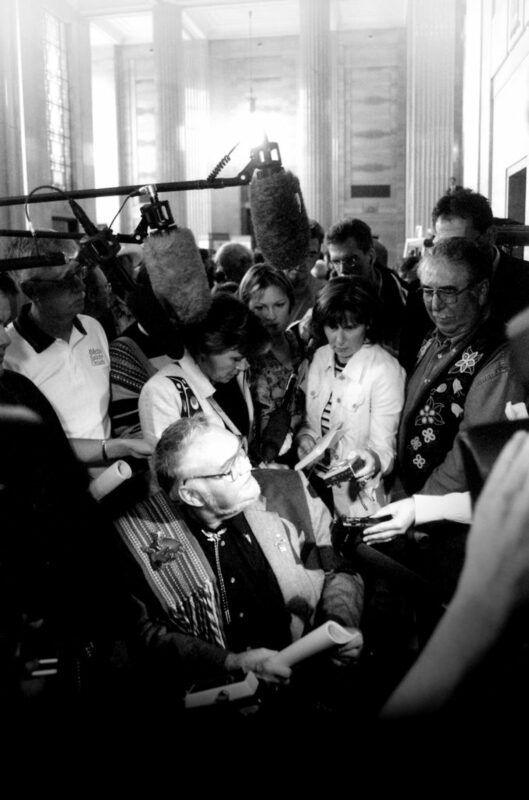 After intense consultations with the MAA, the Premier of Alberta, Peter Lougheed, proposes the final wording for what would become s. 35(1) of the Constitution Act, 1982: “The existing aboriginal and treaty rights of the aboriginal peoples of Canada are hereby recognized and affirmed.” “Aboriginal peoples of Canada” is defined to explicitly include the Métis. 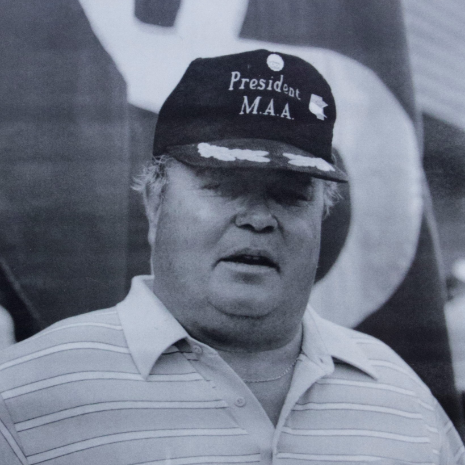 Sam Sinclair, MAA President, 1979-1988. 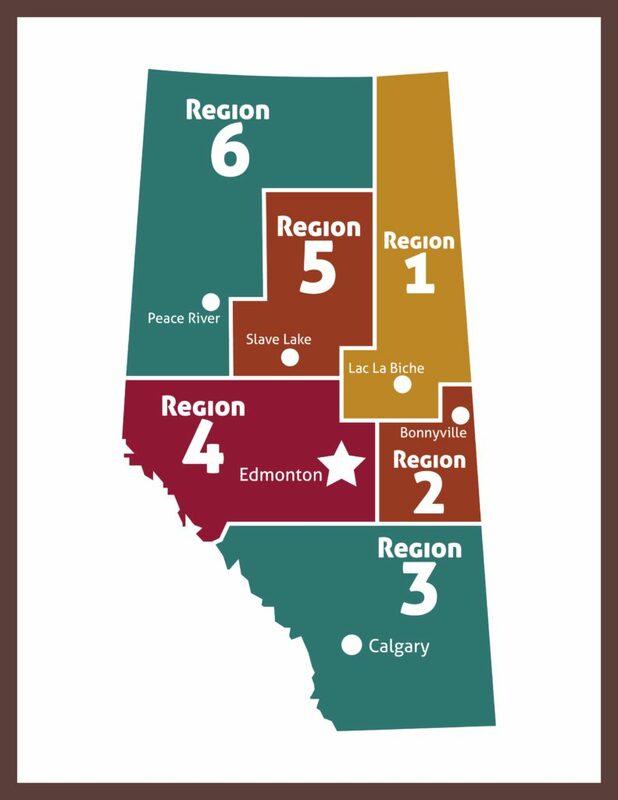 Regional offices are established in each of the MAA’s six Regions, significantly increasing the MAA’s capacity to serve Métis Nation citizens across Alberta. In response to the inclusion of “Métis” as an Aboriginal people with s. 35 rights, the MAA restricts its membership to Métis persons, excluding non-status Indians. The Province of Alberta and the MAA sign their first framework agreement. 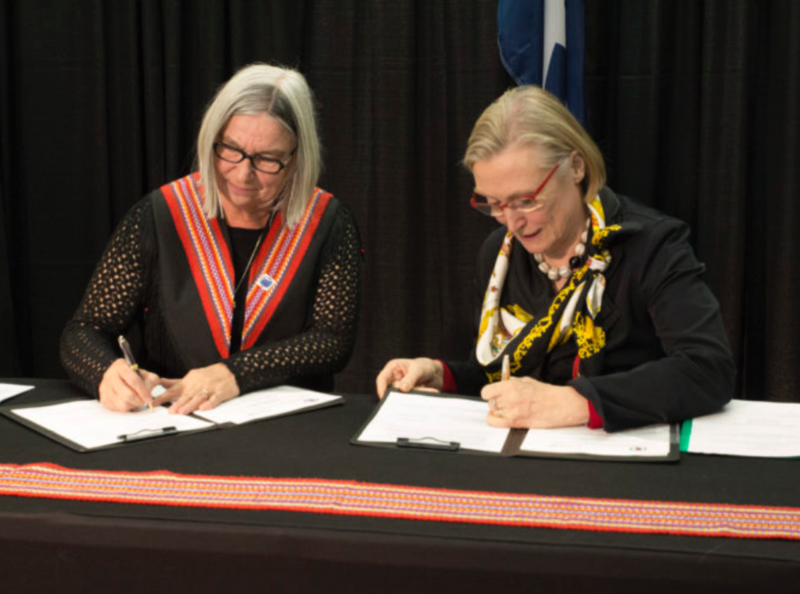 The MAA becomes the only Métis government in Canada to have a framework agreement with a provincial government. The framework agreement provides the MAA with stable, predictable funding to pursue the priorities of the Métis Nation within Alberta. 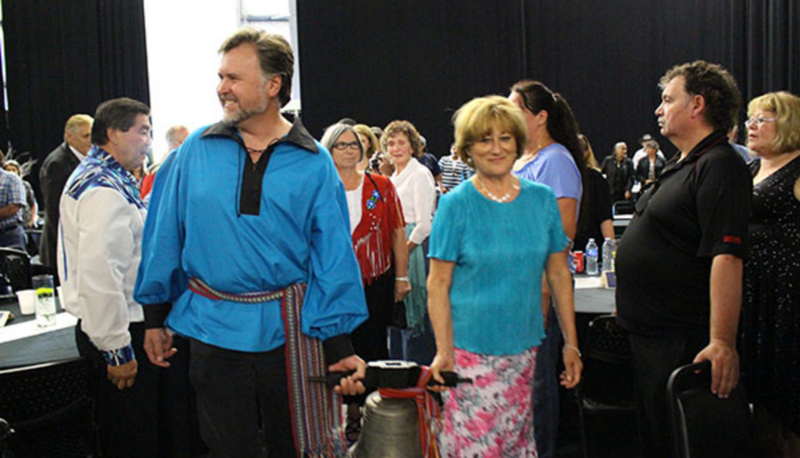 The MAA changes its name, officially becoming the Métis Nation of Alberta Association (MNA). The name change is an unambiguous assertion of Métis nationhood. It also clearly signals the kind of relationship the Métis Nation of Alberta intends to establish with the federal and provincial governments: nation-to-nation, government-to-government. 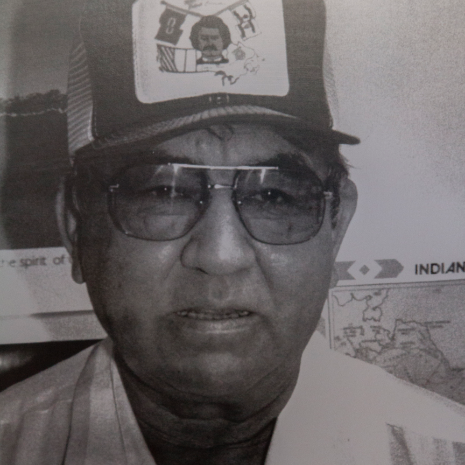 Larry Desmeules, MNA President, 1988-1993. The MNA Annual Assembly formally adopts the National Definition of Métis for Citizenship within the Métis Nation into the MNA Bylaws. The MNA begins the process of re-registering all its members. This work ensures that all MNA members are rights-bearing Métis individuals. The Supreme Court of Canada confirms that s. 35 of the Constitution Act, 1982 protects Métis rights. The Court urges Métis groups to standardize their registration systems to identify Métis rights-holders in an objectively verifiable manner. Steve Powley at the Supreme Court of Canada. Alberta and the MNA sign the Interim Métis Harvesting Agreement, which allows MNA members to harvest throughout the province. 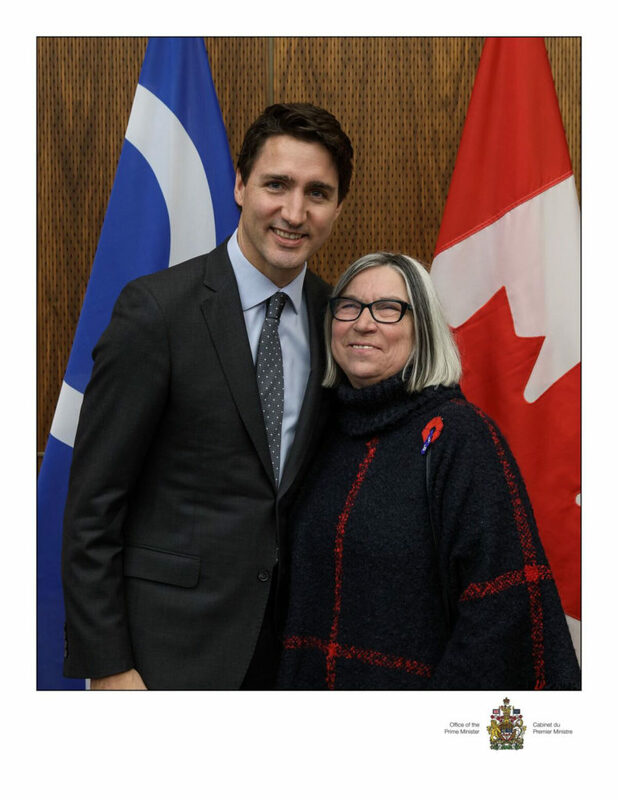 The MNA issues its first new membership card, based on the requirements of the National Definition of Métis for Citizenship within the Métis Nation, to MNA President Audrey Poitras. MNA Provincial Council receiving the first new MNA Membership Cards to be issued. Alberta cancels the Métis Interim Harvesting Agreement and unilaterally imposes a new provincial policy on Métis harvesting in Alberta. The MNA Annual Assembly rejects Alberta’s unilateral Métis harvesting policy and adopts a 4-part Métis harvesting rights action plan: 1) to exercise the Métis Nation’s rights by organizing hunts; 2) to defend Métis rights by challenging charges brought against Métis harvesters in court; 3) to undertake political action; 4) to educate the public. We called this our hunt for justice. Garry Hirsekorn is charged under Alberta’s Wildlife Act for shooting a mule deer in the Cypress Hills. 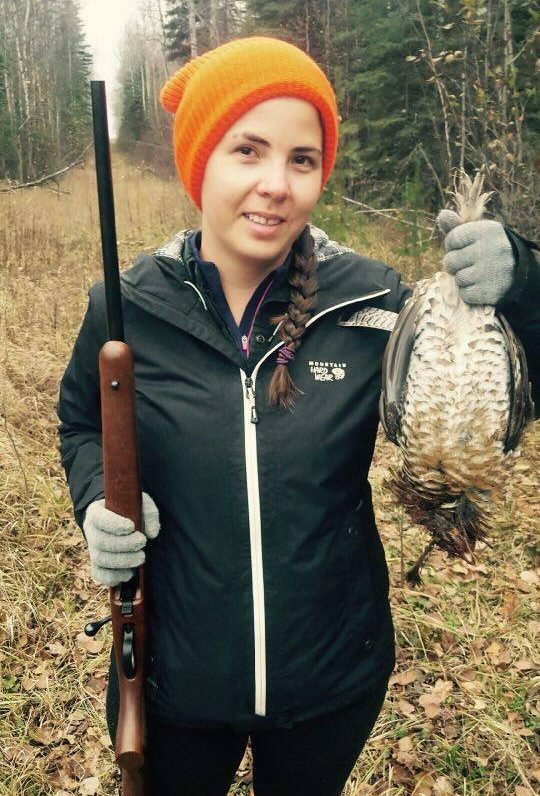 The Provincial Court of Alberta convicts Mr. Hirsekorn, holding that there was no historic Métis community in the Cypress Hills and that, as a result, there can be no contemporary Métis hunting rights in that part of the province. 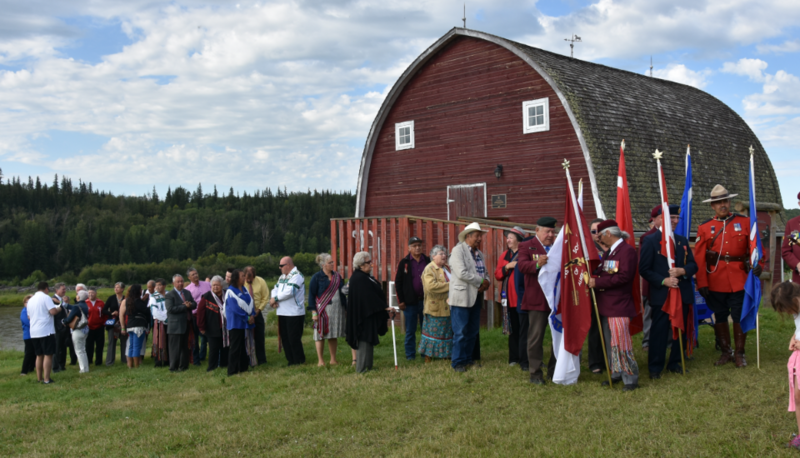 The court recognizes a historic Métis community in central Alberta. Ultimately, this decision is upheld on appeal. The Supreme Court of Canada confirms the Manitoba Métis community has an outstanding collective claim against the federal government flowing from the promise of 1.4 million acres of land in s. 31 of the Manitoba Act, 1870. The Court also recognizes the Manitoba Métis Federation’s standing to advance this claim based on the authorization it receives from its members. This decision sets the stage for a possible Métis claim relating to scrip in Alberta. 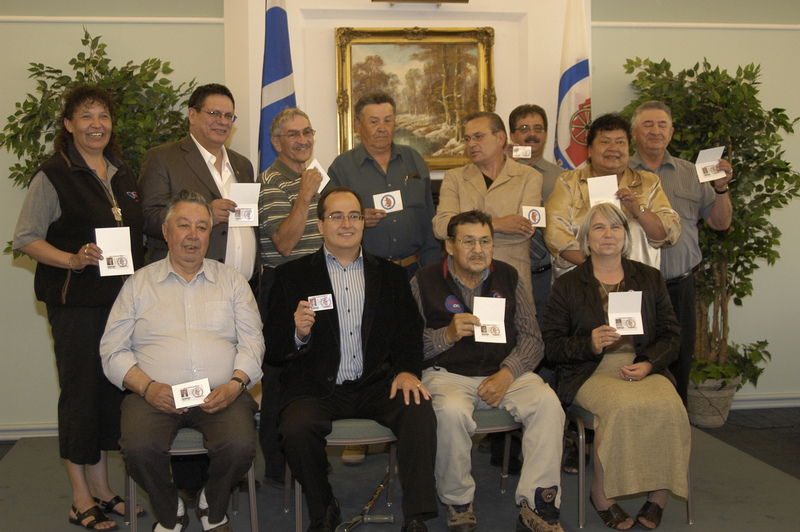 The MNA Annual Assembly cancels all old “red and white” membership cards because they do not meet the documentation requirements of the National Definition of Métis for Citizenship within the Métis Nation. The Supreme Court of Canada confirms that the federal government is responsible for dealing with Métis issues. 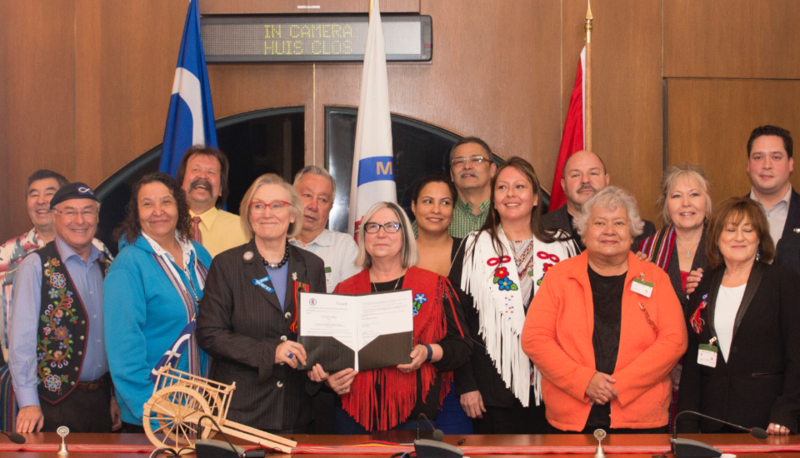 The MNA Annual Assembly amends the MNA Bylaws to include negotiating a modern-day treaty on behalf of Métis in Alberta as one of the MNA’s objectives and to adopt a new Oath of Membership. The new Oath provides clarity regarding the MNA’s mandate to advance Métis rights and claims on behalf of Métis in Alberta. Alberta and the MNA sign a renewed 10-year Framework Agreement, in which Alberta “recognizes the MNA’s representative role on behalf of its Citizens.” The Framework Agreement includes commitments to deal with Métis harvesting, consultation, and other rights related issues. Canada and the Métis National Council and its governing members, including the MNA, sign the Canada-Métis Nation Accord. The Accord confirms that the Métis National Council’s governing members are mandated and authorized to represent the Métis Nation’s citizens to deal with collectively held Métis rights and claims against the Crown. Canada and the MNA sign the Framework Agreement on Advancing Reconciliation. This marks the beginning of formal negotiations towards the recognition of Métis rights, resolution of long-standing grievances (such as those relating to the scrip system), and the establishment of modern self-government for the Métis Nation of Alberta.